Posted by Fiona in Craftiness, Knitting, Look what I did, Patterns. This is one of the big things I missed out on telling you about in the last few months – in August, I published Uskglass. 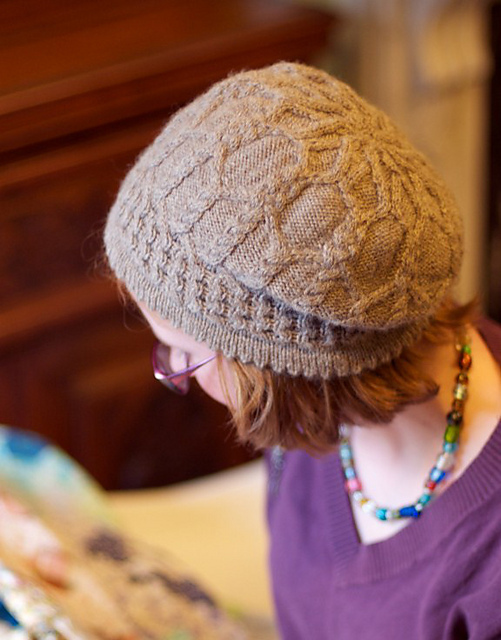 Do you remember the green sample hat I christened ‘Strange’? It got a makeover, and I love it very much. It amuses me that I ended up in Edinburgh, actually, because the first sample for Uskglass was knitted the first time I ever came here, and I remember adoring the place and being really worried that I wouldn’t be able to come back. And then, it was published from the Starbucks on the High Street while I was up for the Fringe, and now I’m living here properly. I feel like Uskglass was lucky for me. It was originally designed around the book Jonathan Strange and Mr Norrell, which is one of my favourites, but quite sensibly my tech editor pointed out that calling a hat ‘Strange’ when it wasn’t in the least bit strange was bound to give the wrong impression, so it got renamed after John Uskglass, the Raven King from the book, the most powerful English magician possibly ever to have lived, and who had a strong connection with Britain and its history. I like to think that that’s fitting – the cables from Uskglass were inspired a bit by traditional ganseys. The honeycomb band, particularly. I’m a bit in love with slightly slouchy hats with a deep brim at the moment. There’s at least one more on the way. Watch this space. And can I talk about the yarn for a moment? It’s grey. For a change. I really need to knit something that isn’t grey, it has turned into my default colour. It’s also Rowan British Sheep Breeds DK, and it’s Bluefaced Leicester. The more BFL I get to play with, the more I like it. It’s so shiny. It smells so sheepy. It barely pills at all, and it appears to be the warmest thing in the world. If I could afford a jumper’s worth of Rowan, I’d be knitting one right now – it’s so much fun to knit with. As it is, I’ve worn this hat about four days a week for the last month (‘warm’ is relative, I think – I know we’re supposed to have had a heatwave!) 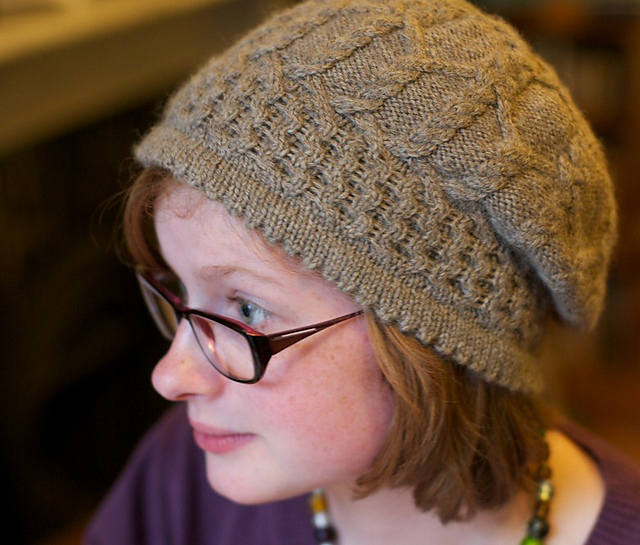 and I think the combination of the yarn and the cables make it the warmest piece of headgear I own. So yeah. New knitwear. Three sizes. I love it. Say it’s not just me? Posted by Fiona in Big things, Breaking the fourth wall, Edinburgh, University. Well, I thought it was about time I got this up and going again. A lot has changed since the end of July, and I’ve not been on the internet for a lot of it. I mentioned before that I was heading off to do a Masters in Edinburgh – well, I’m here now, and I’m completely snowed under a lot of the time. I’ve been mostly absent from Ravelry for the last few months as well – which is another thing I’m going to have to rectify in the next few weeks. Frankly, I’ve not really been on the internet so much. But there’s been a lot going on and I think I’ve been able to cope with it, and adjust to it, a lot better for just keeping out of the way for a while. I hope you haven’t minded. Anyway, I’m back now. I miss blogging and I’ve missed the blogging community as well – I’m sure a lot of changes have happened where you are, too! So over the next few weeks I’m going to instate a rule of making sure to post at least once a week. I want to get back into this, and I miss the dialogue of it too. There’ll probably be a fairly high proportion of knitting posts for a while, partly because I have some absolutely smashing FOs and WIPs to show you, and partly because unless you’ve developed a sudden interest in the law of the sea, you really don’t want to know the gory details of my degree right now. Also, my god, but Edinburgh is beautiful. I’m going to have to show you a few bits, you’ll absolutely adore the place. It’s stunning.